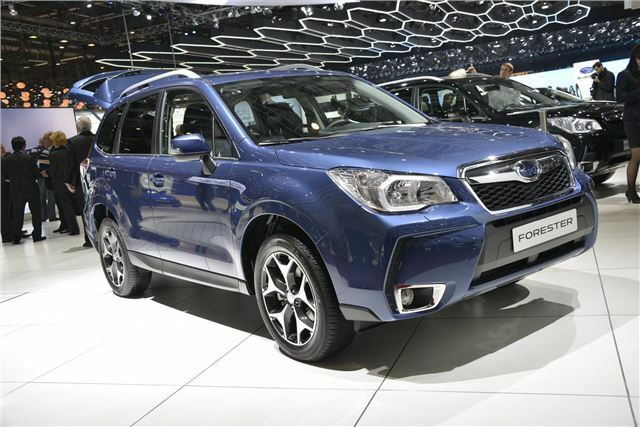 The new Subaru Forester has been unveiled at the 2013 Geneva Motor Show ahead of its introduction to the UK market in May. It's a comprehensive facelift of the outgoing car, rather than an all-new model, but sharper styling gives the capable off-roader more showroom appeal. It’s the fourth generation model and is designed to continue the rugged, capable nature of the outgoing model, but with improvements to fuel economy, safety and cabin quality. It wears sharper styling similar to that introduced on the XV crossover model. The brand’s Subaru’s ‘Symmetrical All-Wheel Drive’ system will still be used, as you might expect following Subaru’s recent announcement that it plans to concentrate heavily on SUVs and crossovers in the UK, so much so it has dropped the Impreza hatchback and WRX saloon. The interior has been similarly smartened-up with a new dashboard and fixtures and fittings, with the intention of making the well-made but slightly dour outgoing model more inviting.